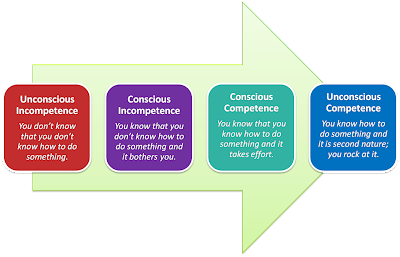 A trader needs to go through the four stages of developing competence in their trading activities. develop the ability to control your mind, and avoid self-sabotage. Concentrating on the process, and not the outcome, will help you achieve this. As a coach and mentor, my goal is to help traders who want to learn how to trend follow to get to that final stage. Fortunately, almost all of those I have met or spoken to have a healthy respect for risk. Without this, you are doomed to fail. From there, you add in the system entry and exit rules, what to look for in a good set up etc. Then you support and help them through the inevitable good and not-so-good periods. This part is accelerated by participating in different market conditions - trending or non-trending, quiet or volatile. Having the ability to talk and correspond with other traders using the same approach can help reinforce the discipline to stick at it. All while this is going on, the traders subconsciously begin to develop the skill to simply follow the rules of their chosen method, along with the confidence and discipline to follow the system. Quite a different approach from those who flit from one system to another. Then, things start to click into place. As Ed Seykota might say, they have an 'A-ha!' moment. They will still make mistakes (I do!) but they instinctively know what to do given a situation either with the market in general, or in an individual stock or position. "Give a man a fish and he you feed him for a day. Teach a man to fish and you feed him for a lifetime."